Yabb Messenger available now for iPhone and Android - Yabb Messenger – Free Calls, Text Messages, Group Chat and Photo Sharing. iOS and Android users who are fed up with having to open their (virtual) wallet every time they want to connect with friends or family, can now relax and never spend another cent by downloading the innovative new app Yabb Messenger. 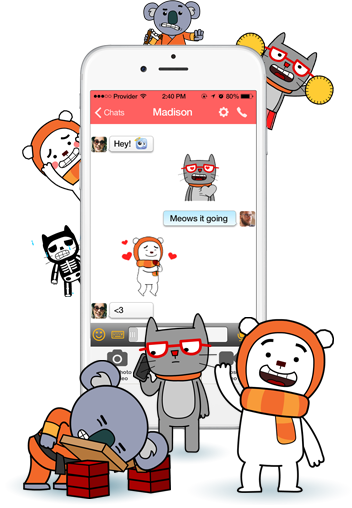 Developed by Baycall for iOS and Android, Yabb Messenger lets users send text, pictures, voice messages, emoticons, animations, maps, stickers and YouTube videos to anyone who matters -- anytime and anywhere -- over 3G, 4G and Wi-Fi networks, without spending a cent. Users can even create an unlimited number of chat rooms to connect and share content with friends in real-time. Each chat room has its own name, icon and customizable background; each of which can be changed by its administrator in a matter of seconds. > A growing library of fun emoticons and cool animations to share. > Group chat with public and private options to ensure the required level of security. > Push notifications to ensure that users are immediately alerted to all content sent their way (e.g. texts, pictures, etc.). > Status notifications so users can let friends know what they're doing - or what they'd like to be doing. > The ability to instantly share maps showing either current location or any required location. > The ability to share short audio voice messages. > A built in editor that lets users spruce up their pictures with interesting filters and effects. > The ability for users to auto-sync contacts in order to see who is currently on Yabb Messenger. > The option for users to add new contacts through Facebook, email or SMS (users earn points by inviting new friends to join via Facebook). > An innovative "Shout Out" feature that lets users send messages to multiple recipients who can only identify and respond to the sender, and not the other recipients (similar to an email "bcc"). > A great Snapchat-inspired "Whisper" feature which lets users send content - including texts, photos, maps, voice messages, videos and more - that disappears within a few seconds after being received. > The ability to search and send YouTube videos without having to exit the app. "No matter how inexpensive a mobile phone data plan may seem, many users end up having to pay much more than they imagined when all of their texting and messaging costs are added up," commented Kenneth Ting of Baycall. "We don't think that people should pay just for a messaging service to text, chat, or send pictures and emoticons to their friends and family, and that's why we created Yabb Messenger. There are no catches, no gimmicks and no subscription fees. It's simply and clear the best way for users to socialize, anytime and anywhere!" Yabb Messenger, the new no-cost app that lets users connect with friends and family via text, chat, pictures, videos and more - without spending a cent - is available now for iPhone and iPad from the App Store at https://itunes.apple.com/app/yabb-messenger/id706086506, and for Android devices from Google Play at https://play.google.com/store/apps/details?id=com.yabb. Baycall is a next generation Telecommunications company that is Headquartered in Sydney, Australia. Established in 2002, Baycall was built on the belief that many of the world's problems can be improved upon with the availability of affordable, convenient and globally-available communications. With these values, Baycall quickly grew to become one of the largest next generation Telecommunications company in its field. It currently provides low cost telecommunication services to individuals, corporates, non-profit organizations and universities worldwide.